We've published yesterday the second short story in the “All or Nothing: Requiem” miniseries. It contains heavy spoilers for Living World Season 4. To read the story, visit the official page. Click Zafirah’s portrait on the official page and follow the links through her thoughts. I loved it, it offers great insight into the Zaishen and the tenants they teach. It makes much more sense now why people would worship Balthazar as a God of War if they see him as a valiant protector of the innocent and a swift avenger of the wrongs they suffer, as compared to the ruthless and cruel tyrant god he ends up being. I’m excited to see the final story, especially with the tidbits of information we’ve seen floating around on the internet about the upcoming War Eternal. It was quite interesting to read, I didn't expect the hamaseen to pop up in there, but it makes sense the way it was explained. 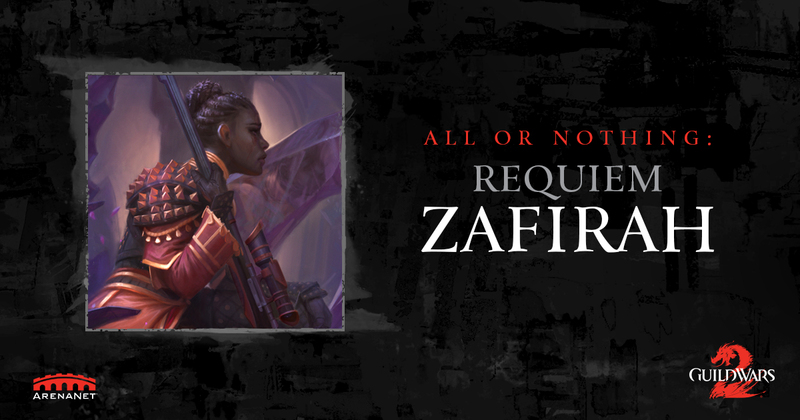 I kind of hope Zafirah ends up as a possible addition to Dragon's Watch. Might be just me, but I have a feeling that what she saw in Balthazar at first, she sees in the Commander now. Not to mention a very long range support for story missions bring up interesting scenarios. I foresee a heist in the future.... I mean, I wish. It's a great story and all, but it glosses over the fact that she was gunning down innocent people when we met her. She says she wants to be angry at Balthazar? Sorry, but when push came to shove, she did the same thing that Balthazar did. When faced with a harsh reality, she refused to accept it. Instead she clung desperately to her past role/calling, threw out her morals, and killed anyone that looked to be in her way or a threat to her plans. I'm not saying to throw the character out. Just... please! Stop glossing over what she did! Let her face some punishment for it. If that punishment is to be stuck by our side for the suicide mission of "Let's save Tyria", then that's more than fair. That's sort of how we got Canach on our team, after all. And it's the same sort of punishment Valette Wi is facing now. She needs to face punishment, not just for herself, but as a representative of all of Balthazar's followers that were "just following orders". Nice piece (although I'm too curious about the next part to fully appreciate this one, I admit). Could the stories get their own easily accesible place? Like a link (could be at the top of the GW2 sites next to Wiki, Forums...) leading to a page with list of stories and a timeline placement of each of them, so people can avoid spoilers. Because if you have a look at the thread about Rytlock's story in lore subforum, you'll see that a few weeks after the release people didn't know about it and that's a pity. Kinda re-enforced the idea of Balthazar being a shallow blood thirsty guy with not other elements to his character. I feel like that made Balthazar one of the weak chains of the pof storyline and i had hoped this story would go deeper and sort of give us a glaust like afterview of him. Oh well, the Zafirah stuff were very nice. I think it would be really interesting if she permanently joined the commander's guild because we really need more characters like her - shadowy people with a troubled past, kinda like Caithe. I'd like to see how they interact in the future. Not sure if serious... isn't that all of DW? I'm sure this story is awesome. Waiting for WP to read it to me. Thanks for these stories! I didn't know much about the Hamaseen or the Zalambur's past/job (I probably missed some dialogue/hint here and there), so it was nice to cover this gap. Like for Rytlock, it didn't help to "love" more the character, but to understand it better. Speaking of Rytlock and Sohotin, can someone explain why the skill #2 of Sohotin changes according to the class/profession of the wielder? I thought it was awesome with my mesmer, spamming 2 clones per skill, but the firing trail with the warrior was amazingly OP. I look forward to reading the next one on Caithe. Despite so many years, she's still an enigmatic character. I was honestly bored with how generic this tragic story reads as.